Richards Bay is South Africa’s largest harbor, situated on an 11.5 square mile lagoon off the Mhlatuze River on the northern coast of KwaZulu-Natal. It began as a makeshift harbor set up by the commodore of the cape, Sir Frederick Richards, during the Boer War of 1879. In 1935 the Richards Bay Game Sanctuary was created to protect the ecology around the lagoon and by 1943 it expanded into the Richards Bay Park. The town was laid out on the shores of the lagoon in 1954 and proclaimed a town in 1969. In 1976 Richards Bay Harbor was converted into a deep-water harbor with railway and an oil-gas pipeline linking the port to Johannesburg. Later, an aluminum smelter, (the largest in the word) and fertilizer plant were erected at the harbor. The port handles the largest exporting of coal in the world. Titanium is mined in the sand dunes close to the lagoon. Today 150 million tons of cargo is handled annually through this port. Until 1870 the economy of South Africa was almost entirely based on agriculture. With the discovery of diamonds and gold in the late 19th century, mining became the foundation for rapid economic development. In the 20th century the country’s economy was diversified, so that by 1945, manufacturing was the leading contributor to the gross national product. By the 1990’s, services contributed almost 60% of the GNP, while industry contributed over 35% and agriculture only about 5%. Tourism now plays an integral part in the local, as well as the national economy. About 1860 with the large sugar cane plantations and not enough labor to handle the farming and picking of the sugarcane, people were brought in from India to assist with the harvesting. They were required to commit to working for a minimum of five years. This brought many Indians to South African and they still remain today. Our tour this day was to the Shakaland Zulu Village, about an hour’s drive from the port. On our way to the village, we passed mile after mile of sugar plantations as well as some orange groves. The weather was cool and rainy most of the day. Shakaland village is where the 1985 mini series of nine hours, Shaka Zulu was filmed. King Shaka was the King of the Zulu people and was famous for uniting many tribes into one large tribe. 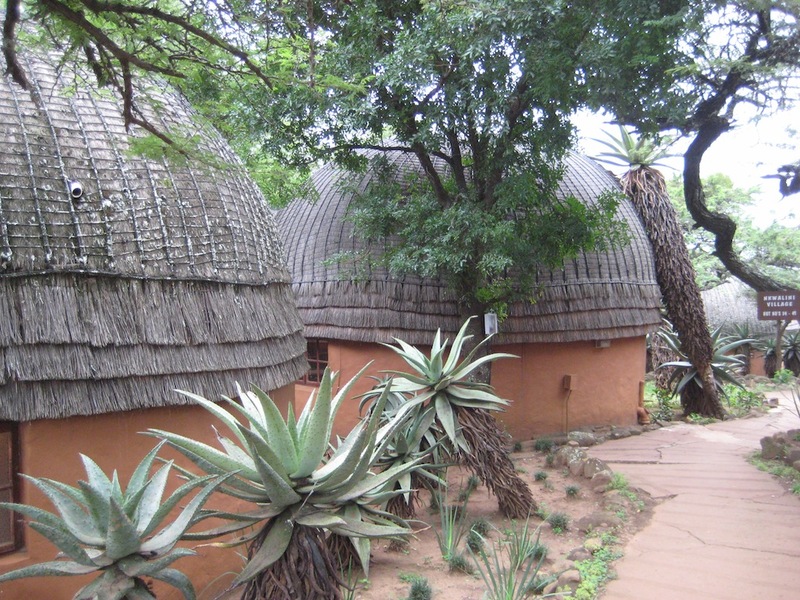 The Shakaland mini series set was converted to a cultural center and small hotel after the filming. Today you can stay in individual round huts, similar to those of the Zulu’s, made completely out of natural tree branches, sticks and grasses woven together. There is a swimming pool and restaurant for hotel residents to enjoy as well. We watched a short video created out of the mini series footage to give us an idea about the Zulu people. 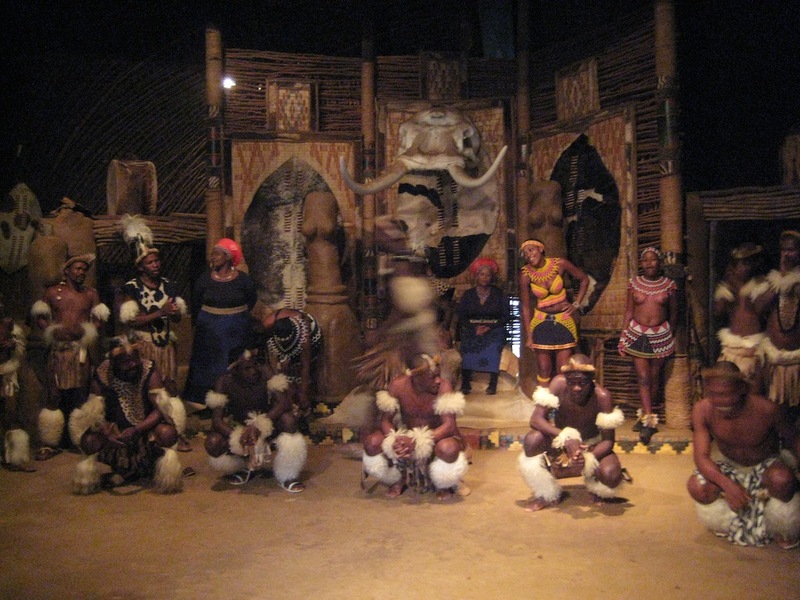 The cultural center has many people dressed as the Zulu’s would dress to provide entertainment and to tell the story of the Zulu people. They performed Zulu dances (unmarried women danced without their tops), told us about the Zulu medicine man, showed us about the Zulu dress and traditions and handicrafts. The women do beadwork, weave mats, sculpt pottery, bake bread and even brew beer. The Zulu men show you how to carve spears and shields and how to built a hut. Unfortunately, some of the activities were limited on this day due to the rain. A buffet lunch was included for us in the Kwabonamanzi Restaurant including a beef stew, chicken curry, ground corn with a consistency of rice, sweet potatoes, pumpkin, white rice, salads and fresh made bread. Several desserts were also available. It was my impression before arriving in South Africa that the country was desert with sparse vegetation–but not here. Most everywhere we went you saw green fields of sugarcane or citrus trees and things were much more green and lush than I had imagined. When we did see what they called “the bush”, it was much more thickly vegetated and green. The evening’s entertainment was a variety show featuring the past three singers and comedians (John Martin, Richard Gauntlett, and Bayne Bacon) who had performed recently.